This post is part of our Conscious Consumerism series to encourage our readers to live – and buy – responsibly. As marketers in the purpose economy, we see it as our job to help people make purchasing decisions that align with their values and contribute to the greater good. Want to learn more about our mission? Download our Manifesto. It’s natural to think about Earth Day globally (shameless pun intended). We think of large-scale climate change, the state of Amazonian rainforests, droughts wreaking havoc on foreign ecosystems and animals imperiled by unfettered development. There’s no shortage of ways that concerned citizens can take action on global challenges: they can donate to nonprofits aligned with their concerns, buy from eco-conscious companies or reduce their carbon footprints by buying renewable energy and making other “green” choices. It’s less common (and, admittedly, a little less exotic) to think about what’s happening exactly where we are – on the earth that we “own.” While it isn’t as grandiose to ponder, there are plenty of ways to take action that have a big impact on the earth right here (Click to Tweet!). I’ve rounded up a list of four considerations that environmentally minded folks should think about when they choose what to do with their own little piece of the earth. While all of these considerations apply to those with a yard, there are a few actions even apartment dwellers can take, which I’ve marked with an asterisk. So, whether you own a three-acre plot with streams and trees or three herb pots with withering greens, here’s how you can take action on your earth this Earth Day! Beginning in the 19th century, suburban America took to lawns like fish to water—and sadly, both fish and water have been adversely impacted ever since. It will require less water and supplemental fertilizers. Consider Eco-lawn seed, which is more resistant to drought, requires no fertilizer, and requires mowing less frequently. Water in the early morning to minimize evaporation and let the lawn dry out before you water again. It wasn’t for nothing that Rachel Carson said pesticides and herbicides should be called biocides. They don’t just kill “pests” – they kill life. The EPA estimates that US citizens apply over 90 million pounds of herbicides to suburban lawns each year. Where pesticides are used, 60-90% of earthworms are killed. Earthworms are key for healthy soil and healthy soil is key for healthy grass, so lay off the crazy chemicals. Use milk spore to control grubs, use corn gluten or distilled white vinegar for natural weed control and opt for other natural pest control options like pest-repelling plants. Fertilizer washes into local water and causes eutrophication: algae blooms proliferate, their oxygen use elevates, and fish suffocate. Maintaining a healthy lawn will minimize your need for fertilizer but if you still need to add some nutrients, consider grasscycling, which means leaving grass clippings on the lawn to act as fertilizer. This also reduces the amount of yard waste you send to the landfill. If you’re still going to fertilize, do it with organic compost. If you’re really ambitious, make the compost yourself! A gas-powered push mover emits as much pollution hourly as 11 cars. A riding mower emits as much pollution hourly as 34 cars. When the time comes for a new mower, consider buying an electric model. Did you know that meaningful brands have outperformed the stock market by 206%? Michael Pollan wrote a wonderful article about his decision to let his lawn go. He “tired of the endless circuit, pushing the howling mower back and forth across the vast page of my yard, recopying the same green sentences over and over: ‘I am a conscientious homeowner. I share your middle-class values.’” He’d come to the conclusion that “Mowing the lawn…felt like battling the earth rather than working it” and decided to convert most of his yard to garden. That’s certainly one solution, but it’s not necessary to substitute a high-maintenance lawn with a high-maintenance garden to work with nature. If you’re serious about helping wildlife in your area, turning your yard into a welcoming environment is a great way to take action. You can even do these things on your balcony for our flying neighbors as long as it’s big enough to fit some plants and a birdbath. Butterflies and bees will thank you for choosing native plants for your garden. There are a number of reasons to choose native flowers, shrubs, and trees when you’re sprucing up your yard. Even if you’re just putting some planters out on a balcony, you can actually help your local ecosystem by going native! Our friends at Montgomery County, Maryland Department of Environmental Protection (MoCo DEP) explain that native plants are better adapted to the local climate, need little fertilizing and are more tolerant of drought and pests. They also serve as food and shelter to birds and beneficial insects like butterflies and honeybees. A variety of threats to honeybee and butterfly populations mean they’ll be glad of your support. Besides not overwatering your lawn and avoiding introduced plant species that are especially thirsty, there are other actions you can take to make more conscious use of your water. In many urban and suburban areas, a proliferation of impervious (non-permeable) surfaces propagates huge amounts of runoff during and after rainstorms. The water can’t drain into the ground so it runs into streams and other drainage areas very quickly, causing flooding and degrading water quality by carrying lots of fertilizers right to the water source. By making a rain garden, or a depression that intercepts rainwater runoff and gives it a chance to absorb, you can help to capture overlarge loads of runoff. 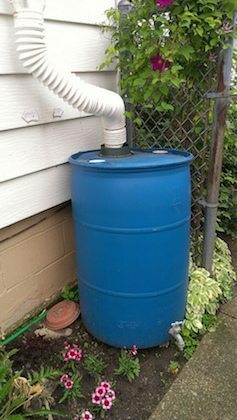 You can also install a rain barrel if runoff is an issue where you live. These reduce runoff and also give you a source of water for lawn maintenance and other gardening needs. Here’s a great in-depth guide on how to make it happen from Montgomery County’s Department of Environmental Protection, Maryland. I hope this quick list of considerations has you thinking differently about your relationship with the earth. As natural as it is to gravitate toward the big issues, there’s no shortage of ways to make a difference right in your own backyard. Do you have some eco-friendly yard care tips I forgot to include? Don’t hold back – plant your ideas in the comments section below! This post was originally published on April 20th, 2016 and updated on April 15th, 2019. Alison was RoundPeg's content marketing specialist though November 2016. We are sure she still spends her days seeking inspiration, writing inspired content, then trying to inspire other people to read it! When she isn't trying to save the world by the might of her pen, she hangs out with her dog Wall-E, reads contemporary literature and eats an impressive amount of chocolate.